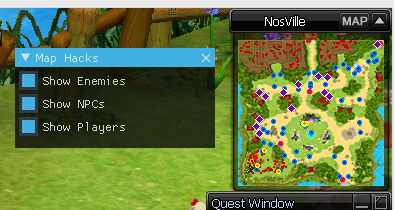 Here is a simple addon to add an in-game UI to enable/disable some basic mini-map features. With this you can enable the visibility of enemies, npcs and players with ease. Paste the below code into that file and save it. * Creative Commons, PO Box 1866, Mountain View, CA 94042, USA. * By using NosHook, you agree to the above license and its terms. * endorses you or your use. * Non-Commercial - You may not use the material (NosHook) for commercial purposes. * NosHook project in attempt to have it added to the original project. * from doing anything the license permits. * No warranties are given. -- desc: Writes a value to the map pointer at the given offset. -- Prevent invalid write attempts..
-- Read into the pointer..
-- Write to the offset..
-- desc: Event called when the addon is being loaded. -- Initialize the custom variables..
-- Set a default value if present..
-- desc: Event called when the addon is being unloaded. -- Cleanup the custom variables..
-- desc: Event called when BeginScene() is called in Direct3D. -- desc: Event called when EndScene() is called in Direct3D. -- Do not render the UI if it was hidden..